Plain Swiss roll sponge with raspberry flavoured filling. Raspberry Flavoured Filling (41%), Wheat Flour, Sugar, Pasteurised Egg, Humectant (Glycerol), Glucose Syrup, Soya Flour, Whey Powder (Milk), Palm Oil, Raising Agents (Disodium Diphosphate, Sodium Bicarbonate), Emulsifiers (Mono- and Di-Glycerides of Fatty Acids, Polyglycerol Esters of Fatty Acids), Dextrose, Preservative (Potassium Sorbate), Flavouring. 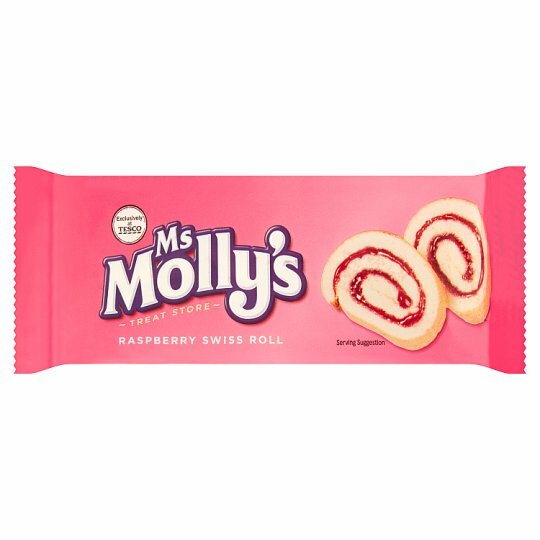 Raspberry Flavoured Filling contains: Sugar, Glucose-Fructose Syrup, Dextrose, Water, Apple Purée, Acidity Regulators (Citric Acid, Sodium Citrate, Calcium Citrate), Modified Maize Starch, Gelling Agent (Pectin), Colours (Anthocyanins, Curcumin), Raspberry Purée, Flavouring, Preservative (Potassium Sorbate). For allergens, including cereals containing gluten, see ingredients in bold. Also may contain peanuts and nuts.